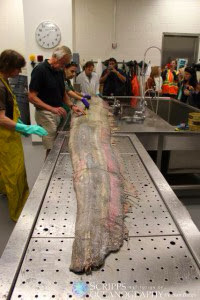 Two opportunities arose last month to study the rare oarfish. On Oct. 13th, the body of an 18' male was lifted from the water off Santa Catalina Island, California (IMAGE HERE). On Oct. 18th, the body of a 14' female was discovered underwater 50 miles away in Oceanside. The second fish was necropsied at the Southwest Fisheries Science Center in La Jolla. Biological samples were shared with colleagues around the globe to study the physiology, morphology, and ecology of the elusive species. The skeleton will be mounted and the head was sent to the Scripps Institution of Oceanography to become part of their collection. Of the rare event, biologist Antonella Preti describes, "The easiest way to tell that this was an exciting scientific discovery was by the spectators in the necropsy lab. As fish dissections can be a little messy and smelly, people who are not actively working on a necropsy project normally avoid this lab, but on this particular morning the lab was standing room only. As I put on my lab coat, I had to weave through a crowd of excited scientists with cameras and iphones, who looked like teenagers waiting outside Justin Bieber’s dressing room."